Balance bikes are available in a huge range of sizes, styles, colours and designs to suit children of any age from 18 months to 12 years – but if you have a little girl then you may well be looking for a pink balance bike! This might be stereotypical, but many of the leading manufacturers are quick to offer their most popular bikes in a striking pink colour to capitalise on this, so we thought we would provide some recommendations for our favourite pink balance bike. 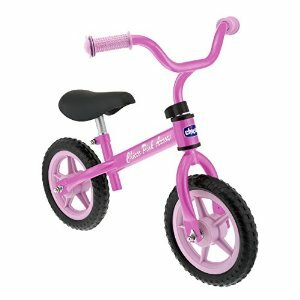 Our first recommended pink balance bike is the high quality Weeride First bike. This bike is designed for children from as young as 18 months - 2 years, so if your little girl has recently started walking and you want to start her out on a learner bike then this would be a great choice. The bike has an easy step through frame, it is lightweight and has an adjustable saddle and all the safety features you would expect from such an established manufacturer. It is not a budget option at around £100, but offers a range of quality features and is an ideal way to get her started on the principles of balance and steering. 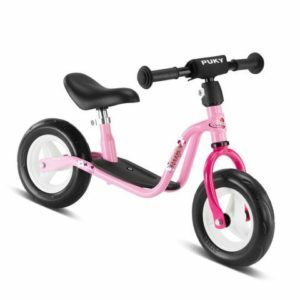 Another great balance bike that is available in pink is the Puky LRM model. Similarly to the Weeride First Balance Bike, this bike is designed for the youngest of children with a step through frame and a very low saddle height starting at just 29cm. It offers a range of features including safety handlebar grips, soft luxury foam tyres and a height adjustable handlebar. The Puky LRM balance bike also features ball bearing wheels and steering. This is a great, mid-range balance bike that is ideal for learning to ride and offers fantastic value. An excellent budget option if you are looking for a pink balance bike is the Chicco Pink Arrow Balance bike. This bike has a thin chassis and a metal frame, and it is one of the lightest balance bikes on the market at just 2.7kg. This is an ideal starter bike for a 2 year old and makes a great introduction to riding as it can be used indoors before the child has enough confidence to venture outside. The Chicco Pink Arrow Balance bike does not have a huge range of features, but it is available for around £30. Kiddimoto are well known for their great range of quality balance bikes, and this includes the fantastic Kiddimoto Kurve. 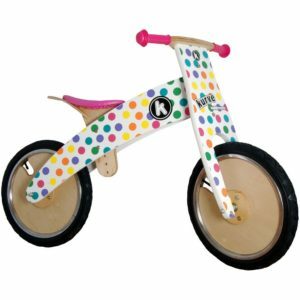 This balance bike is made from birch plywood, so it is available in a number of different and exciting designs, including the Pastel Dotty (pictured) that will appeal to little girls. This bike is suitable for children aged between 3 and 5, as the saddle height has quite a small range between 37cm – 39.5cm. Other features include rubber grip handlebars and pneumatic rubber tyres for a smooth ride. Kiddimito provide a great range of accessories as well including helmets which are also available in a number of different designs. 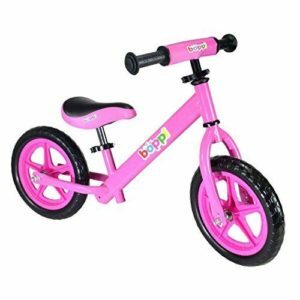 A final choice is the Boppi BMX balance bike which is available in a number of colours including pink. 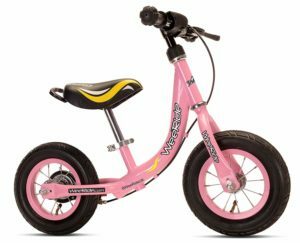 This balance bike is a similar price to the Chicco Pink Arrow bike, but comes in a BMX style with a lightweight metal frame, padded seat and cushion handlebars. The seat can be adjusted from 30cm – 42cm so it will suit all ages between 2 and 4 and can grow with your child. A great value choice, although there are many more pink Balance Bikes out there - and hopefully you will find one that your little girl will love!